EFAs play an integral role in the optimal functioning of our bodies, and build the foundation for overall health. They are required for the formation of cell membranes, and are essential for cerebral and neurological development and functioning. EFAs are also necessary for the production of eicosanoids, which are collectively responsible for regulating blood pressure and viscosity, and supporting healthy immune and in ammatory responses. They have also been shown to improve the biodiversity of the gut. Other ingredients: Capsule shell (gelatin, glycerin, water and carob. One (1) sofitel capsule with each meal as a dietary supplement or as otherwise directed by a healthcare professional. 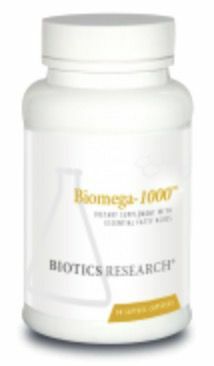 Biomega-1000 fish oil is delivered in the triglyceride (TG) form that is found in nature and shown to be the most bioavailable. Contains ingredients derived from Anchovy.